This picture is a combination of two two separate services that came together to create this image. It is very much a personal reflection on the journey and the place where I have found myself after two years of theological training for Diaconal ministry. 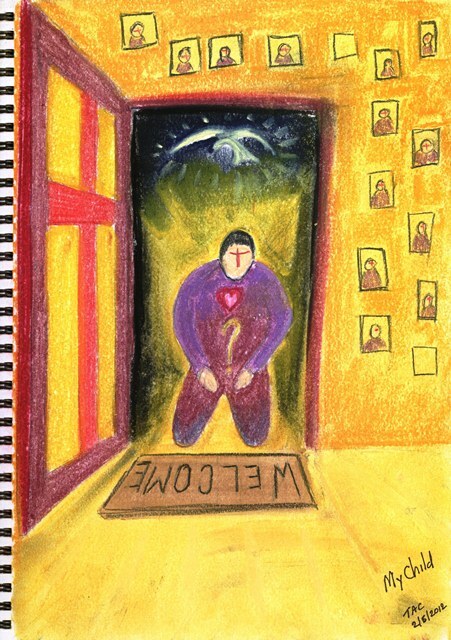 The initial idea stemmed from a Tuesday evening worship service at St John’s college where the preacher, Michael Volland preached on James 5 and focused on prayer as the place where we meet with the father and can bring all our concerns worries and questions to the God who loves us and welcomes us. The second part came at the Wesley Study Center leavers retreat at Sneaton Castle, Whitby where Paul Golightly lead our worship and meditations starting with Proverbs 4:20-27 in combination with the reading from Luke 14:12-24 on the Saturday morning from the lectionary. It just spoke of a God who longs for the broken, the lost, the confused, the weak, the helpless, the sinful to be welcomed into his presence where he nurtures us with the life-giving wisdom from the heart of God. “My Child” reflects that call of God first to be his Child. ; not a minister of religion, not a preacher or teacher, not a theologian, nothing but first a Child of God. And my questions? Well they are mine to ponder and pray. I’m guessing you have you’re own. The place of prayer is the hidden doorway of the soul to the very heart of God where he welcomes us with open arms, receives us and hears our prayers. He hears any prayers said any way with any motives, he is not offended by our brokenness and confusion, our sinfulness of even wickedness for the cross of Christ makes possible the path of redemption to even the worst of sinners. He works with us and in us to bring about the healing and wholeness that will restore us to become who he created us to be. Great or small he welcomes all.